Some of the new Willamette students obviously enjoying their first experience of excavation. And so into week two and, fortunately, after the deluge yesterday, the sun is once again shining on the Ness. It was quite a baptism of fire for the new group from Willamette University, in Oregon, USA, who arrived over the weekend, with their first tour of the Orkney Mainland yesterday conducted through heavy rain and thick cloud. Most, however, said it was just like home! Excavation within Structure Ten that revealed a human tooth today. There was another new intake of volunteers today to bolster our numbers. As an introduction to the site, after they were inducted by site director Nick and finds supremo Anne, they all joined various trowelling lines in Structure Twelve — in the new extension — or in the central midden area (CMA) between structures one, eight, twelve and ten. After many false starts the new recruits are already beginning to recognise the difference between stone and pot, and are gradually getting into the swing of how the site operates. 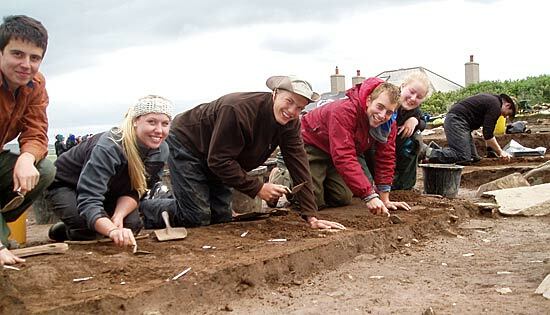 Even at the end of the day there were still smiles all round and many expressing the joys of and therapeutic values of trowelling and archaeology!! Dr Cathy Batt, and her assistant, Danielle, sampling one of the hearths in Structure Eight for archeomagnetic dating. An exciting discovery within Structure Ten was a human tooth. Sarah found it while trowelling back just beyond the central hearth. Although over the years we have recovered a few fragments of human remains associated with Structure Ten, they have all been within the collapse and general infill – this is the first piece to be recovered from a secure context, perhaps relating to the use of Structure Ten, albeit its secondary phase. Fortunately, human bone specialist Dave Lawrence was visiting the site so he was able to confirm that it was human. But a single tooth does not make a mortuary structure but we will wait to see what else may turn up. 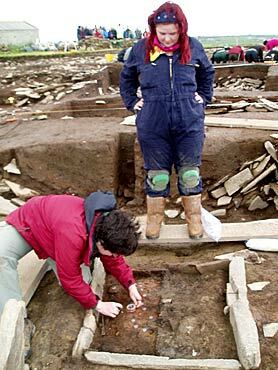 Dr Cathy Batt, and her new assistant, Danielle, turned up this morning to start their programme of archaeomagnetic dating. After much discussion it was decided that three hearths would be targeted this year, one each from Structures Ones, Seven and Eight. Deposits within each hearth were identified as potentially being able to produce good samples – so lets keep our fingers crossed these will provide complementary dates to our radiocarbon dating programme. Colin recording the flue-like structure. Last year, a rather strange structure, that had been built into one end of Structure Seven, was partially excavated. No one on site has seen anything like it – several upright slabs partially defining a depression cut into the midden deposits and filled with a very charcoal-rich and burnt stone layer. 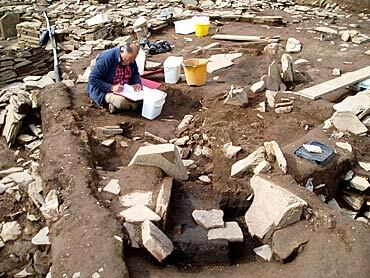 Colin, one of the MA students from Orkney College, has been set to work to reveal the rest of it and finish sampling the material filling it. Hopefully all will be clear once Colin is finished and the sample analysis is completed. Meanwhile, in the extension to the main trench the archaeology is turning into something a little more complex. 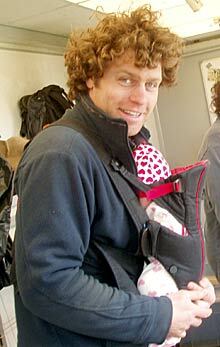 Dan tries to enthuse new daughter, Lucie, about the workings of the supervisor’s hut. We had hoped that by simply stripping away the topsoil the rest of Structure Fourteen would be revealed in all its glory. At first, this seemed promising with the exposure of another stone pier last week, exactly where predicted along its southern wall. However, on its north and east end, things are not quite going to plan. In these areas, rather than coming down straight on to Structure Fourteen, we have hit some of the later, rather ephemeral structures that were built across the site after its major phases were abandoned or deliberately erased. An area of stone paving and some detached, ill-preserved wall lines are being revealed. These will need to be planned, recorded and excavated before we can proceed. But as Director Nick says – always expect the unexpected! Another arrival on site today was the new daughter of the site’s supervisors, Dan and Antonia – Lucie Florence Lee – she seemed to be totally unimpressed with the wonders of the Ness and managed to sleep through the whole visit. We’ll excuse her this time for not showing more enthusiasm as she is only five weeks old! An area of stone flagging is revealed in the new trench extension. My name is Elle Woolaway and I am a graduate of Willamette University, with a double major in archaeology and environmental science. 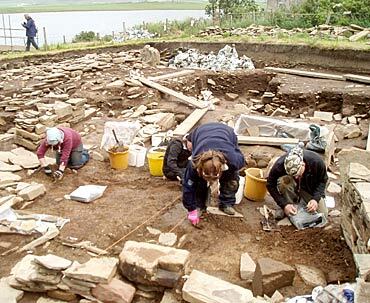 It is rather exciting and quite amazing to think that I am starting my third season of excavation at the Ness of Brodgar today. It was about three years ago that I heard Nick Card lecture about the Heart of Neolithic Orkney at Willamette University and, in a fit of insanity, my friends would say, decided that I wanted to experience it for myself. I showed up that first summer completely alone with absolutely no idea what to expect. 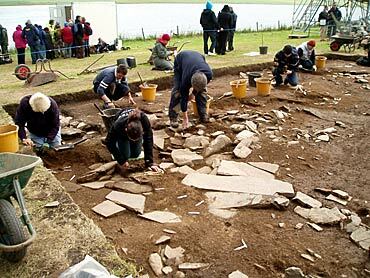 I spent that first summer learning how to excavate using a trowel borrowed from one of the site supervisors. It was a brilliant way to spend a summer and when the opportunity came to return for a second summer with my university’s new field school I jumped on it. I am sure you can imagine my excitement when I realised this past year that a third season at the Ness was not out of reach. So here I am, three years later, with just this season of excavation between me and graduation. It is a little hard to think back and remember what this site looked like when I first arrived. What I do recall is that it seemed so much smaller than it does today. It hardly seemed like anything when I first arrived, some short little walls and tiny bits of pottery and flint. I look at the site now, with three years’ experience and one thesis under my belt, and the site seems almost too big. Some of that growth can be attributed to excavation, it has grown a little wider and deeper, but more than anything it is my own view of the site that has expanded. When I first arrived at the site, each building was just a low wall to me. Now I look at these structures and my imagination runs wild reconstructing what we imagine might have been. What were once abstract bits of pot and flint now tell me a great deal about the dexterity and aesthetic of the people who lived here. I suppose one might say that I have begun to see the site as an archaeologist would. I don’t know the extent to which that view will change over this coming season, especially considering that I will be working on a focused project which will culminate in a thesis for my university, but I am excited to be able to spend another season watching this site grow.